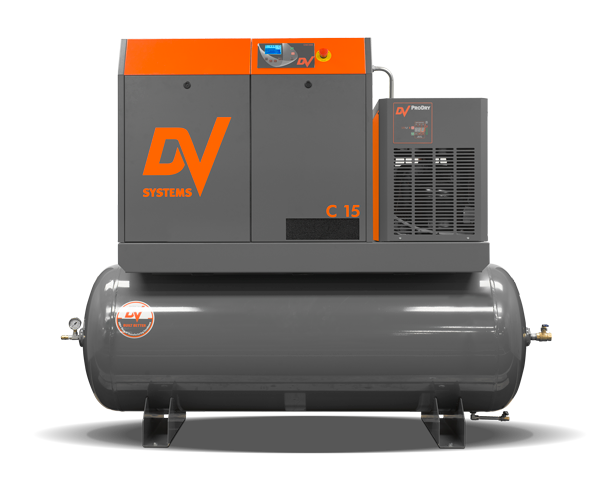 The C15 HP Rotary Screw Compressor by DV Systems is a reliable, rugged and compact rotary screw compressor. Available as both tank mount with built in air dryer or base mount it is the perfect quiet air compressor for your garage, shop or production facility. The base mount option gives you the ability to simply pipe it into your existing compressor tank. This saves space, is energy efficient and gives the peace of mind of have two air compressors during maintenance, failure of one compressor or times of higher air consumption. Both duty types of air compressors,HDI and SDI, offer excellent warranties and we are proud to sell & service them. Call us to discuss your compressed air needs at 705-722-5747 or email us.